In OpenStack, a flavor defines the compute, memory, and storage capacity of a virtual server, also known as an instance. As an administrative user, you can create, edit, and delete flavors. As of Newton, there are no default flavors. The following table lists the default flavors for Mitaka and earlier. In the Admin tab, open the Compute tab and click the Flavors category. 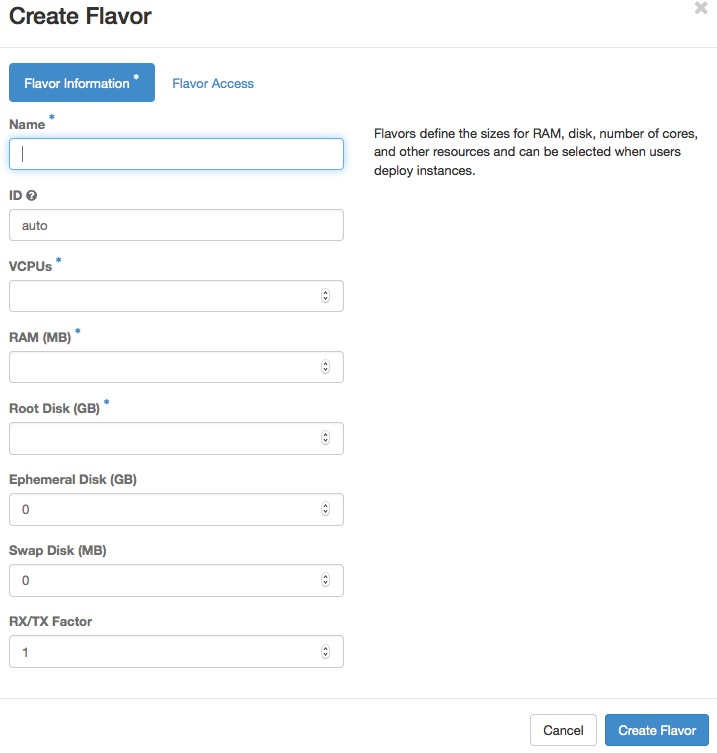 In the Create Flavor window, enter or select the parameters for the flavor in the Flavor Information tab. Name Enter the flavor name. ID Unique ID (integer or UUID) for the new flavor. If specifying ‘auto’, a UUID will be automatically generated. VCPUs Enter the number of virtual CPUs to use. RAM (MB) Enter the amount of RAM to use, in megabytes. Root Disk (GB) Enter the amount of disk space in gigabytes to use for the root (/) partition. Enter the amount of disk space in gigabytes to use for the ephemeral partition. If unspecified, the value is 0 by default. Ephemeral disks offer machine local disk storage linked to the lifecycle of a VM instance. When a VM is terminated, all data on the ephemeral disk is lost. Ephemeral disks are not included in any snapshots. Swap Disk (MB) Enter the amount of swap space (in megabytes) to use. If unspecified, the default is 0. RX/TX Factor Optional property allows servers with a different bandwidth to be created with the RX/TX Factor. The default value is 1. That is, the new bandwidth is the same as that of the attached network. In the Flavor Access tab, you can control access to the flavor by moving projects from the All Projects column to the Selected Projects column. Only projects in the Selected Projects column can use the flavor. If there are no projects in the right column, all projects can use the flavor. Select the flavor that you want to edit. Click Edit Flavor. In the Edit Flavor window, you can change the flavor name, VCPUs, RAM, root disk, ephemeral disk, and swap disk values. Select the flavor that you want to update. In the drop-down list, click Update Metadata or click No or Yes in the Metadata column. In the Update Flavor Metadata window, you can customize some metadata keys, then add it to this flavor and set them values. For information about supporting metadata keys, see the the Compute service documentation. Select the flavors that you want to delete. In the Confirm Delete Flavors window, click Delete Flavors to confirm the deletion. You cannot undo this action.